I need to tell you about this phenomenal evening I witnessed at a sold-out Nectar Lounge Saturday, June 30th. 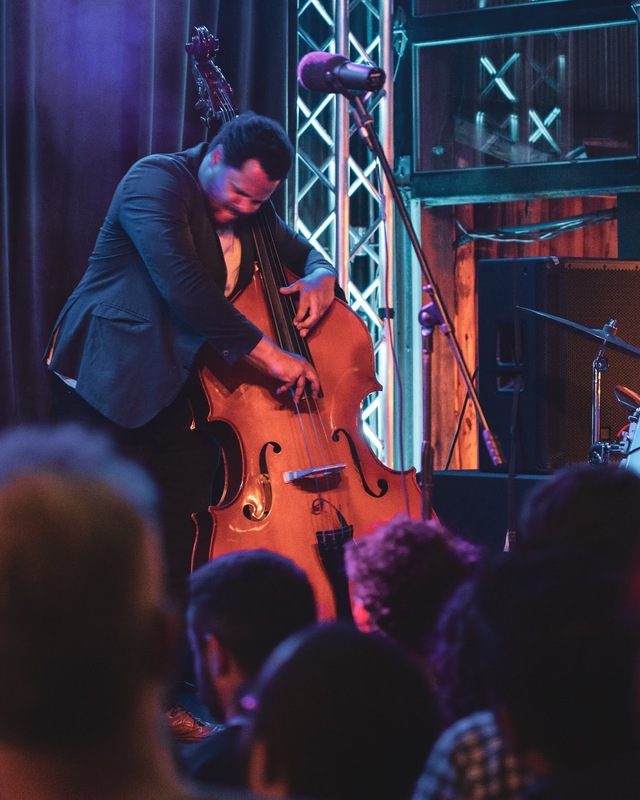 The blurb in the Stranger sounded simple enough: a line-up full of local flavor, with Afrofutrist singer JusMoni and funk band High Pulp opening for jazz group Industrial Revelation. But for the lucky attendees, each artist refused to fit in those predefined boxes. JusMoni (stage moniker of Moni Tep)’s music immediately suggests strong ties to fellow Seattle-based hip-hop/R&B groups THEESatisfaction and Shabazz Palaces – no surprise, considering THEESatisfaction’s Stasia “Mehschel” Irons is the mastermind of the beats. She was camped behind a laptop and microphone on stage next to Tep. The last day of June was a classic example of Seattle’s “June Gloom,” that cloudy not-quite-warm not-quite-cool humidity that sticks to your skin. JusMoni’s music was the perfect cap as the day turned to night. The music drunkenly swirled, swimming from one song to the next. It was dance-y, but introspective. Irons and the crowd seemed to agree with me, as a lot of folks swayed and nodded their heads into their beers. To a newcomer, Irons’ beats might sound a bit sparse – as if someone took Bernie Worrell’s more exploratory tones and put them over a drum beat. But as they flowed past, anchoring Tep’s lilting voice, I began to sense a current of warmth running through them. By the last song, the crowd was wrapped into a sample of Roy Ayers’ “Everybody Loves the Sunshine”… soulful. Perfect. 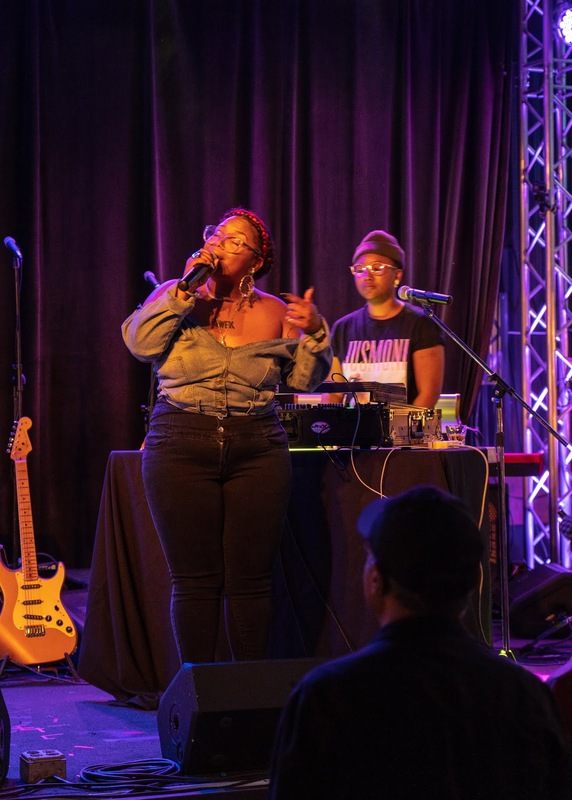 JusMoni is described as Afrofuturism, yet she sings of rooted themes (spiritual growth and family trees), and hip-hop, yet her crooning is soulful. She isn’t quite either, instead blazing her own path. After a duo, seeing the 10 members of High Pulp file on stage is almost jarring. It’s rare to see bands of this size – how often do you need to pull out the word dectet? 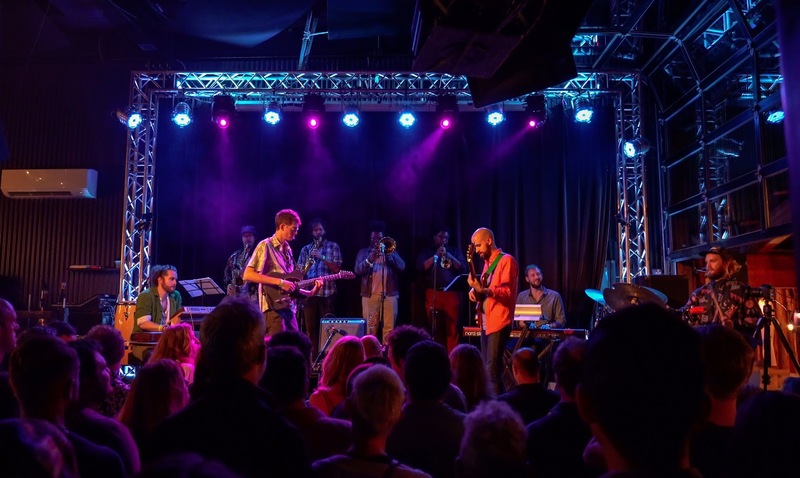 And when a group walks on stage with an instrumentation of drums, percussion, keys, guitar, bass, and horns, one begins to assume the music will sound a certain way. Maybe a funk band á-la Earth, Wind, & Fire, or possibly more groovy á-la Turkuaz? Maybe something more conventionally jazzy? In all these cases, there’s an expectation: the rhythm section provides the foundation over which the horn licks fly. But right away, you realize High Pulp doesn’t fit into this box. Not exactly funk, their music is heavy on texture, space, and suggestion. 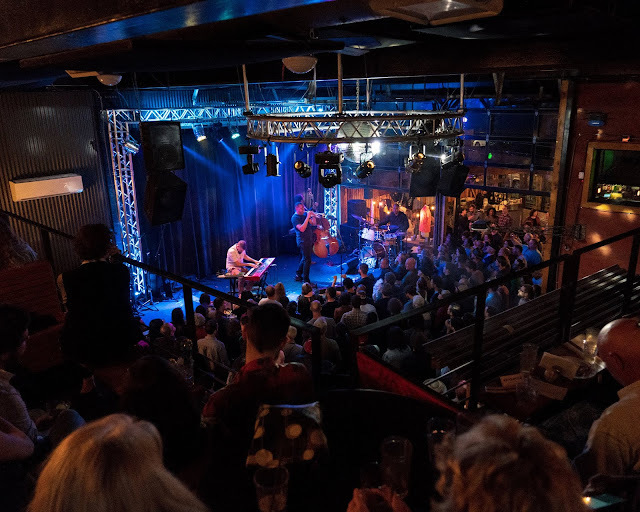 The group has been making noise throughout Seattle since their first show a little over a year ago, including a regular residency at the Royal Room and a blistering set during May’s Upstream Festival. Saturday’s show celebrated the release of their debut album, Bad Juice, and the buzz meant merch sales were already brisk before the band hopped on stage. Drummer Rob Granfelt and frequent collaborator percussionist Walter Torres keep the group rooted, while the remaining eight members jump in and out, juking around each other. 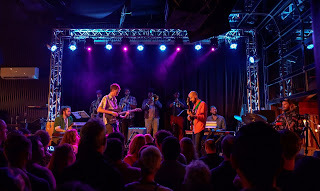 The other non-wind instruments are bassist Scott Rixon, guitarist Gehrig Uhles, and the dual keys attack of Antoine Martel and Rob Homan, while the horn section is made up of saxmen Andrew Morrill and Victory Nguyen, trombonist Isaac Poole (alum of Garfield High), and on trumpet, Alex Dugdale, although the album was recorded with Raphael Zimmerman (recent graduate of Lake Stevens High). High Pulp might be the only band in the world where I wish the guitar would be turned up. Uhles’ six strings are played with heavy reverb, and would not sound out of place in a space or psychedelic rock setting. He and Rixon anchor my favorite song of Pulp’s, “Hookai” (also featured on the new album). The slinky, coiling riff is a memorable earworm. The band’s tightness is clear, as they built tension slowly and patiently under Homan’s keys solo. After this, the band continued the dance workout with the athletic mid-section of their set: “Jason Williams” and “Serena Williams” bookended a tune called "Sport." This portion of the show helped to highlight one of High Pulp’s unique features that makes them “not quite” a funk band. For a dectet, the music feels vast and spacious. Rather than the conventional rhythm section foundation beneath horns you thought you’d get, often it was the horns that provided the grounded base beneath Uhles’ space-y guitar and ethereal one-two of Martel and Homan’s other-worldly tones. The last song on the sandwich featured tempo changes on a dime, yet another sign of the band member’s comfort with each other. Granfelt informed us they would only have time for two more songs. After the slower, more introspective “Sermon” came “Smooth.” It’s a high-energy, fitting closer, so it’s no surprise that the tune usually finds its way towards the end of Pulp sets. It was extended, with solos passed around stage. The band built furiously to the end, but just when we thought the curtains were falling - a bonus! They surprised everyone with the outro to another staple, “Pushin’.” The group’s willingness to chop, mix, and play with their catalog is a strong tool in their arsenal. Consistent gigging has allowed them to craft “midnight” versions of many of their tunes. One, “Fishbowl,” a dreamy reworking of “Hookai,” is found on the record. 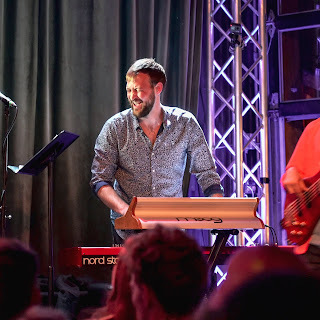 Too spacey to be called just a funk band, too varied and tight to be called just a dance band, this group knows exactly the kind of ethos they are going for, with their second and third albums already outlined. I know I can’t wait to find out what they do next – and from the reaction of the crowd, so do many others. Pick up the record if you haven’t already! I was particularly excited to catch Industrial Revelation. Finally catch. 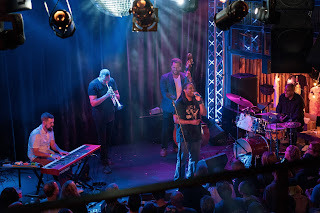 The quartet is imposing – Ahamefule J. Oluo on trumpet, Evan Flory-Barnes on the upright, Josh Rawlings on keys, and the indomitable D’Vonne Lewis on drums. 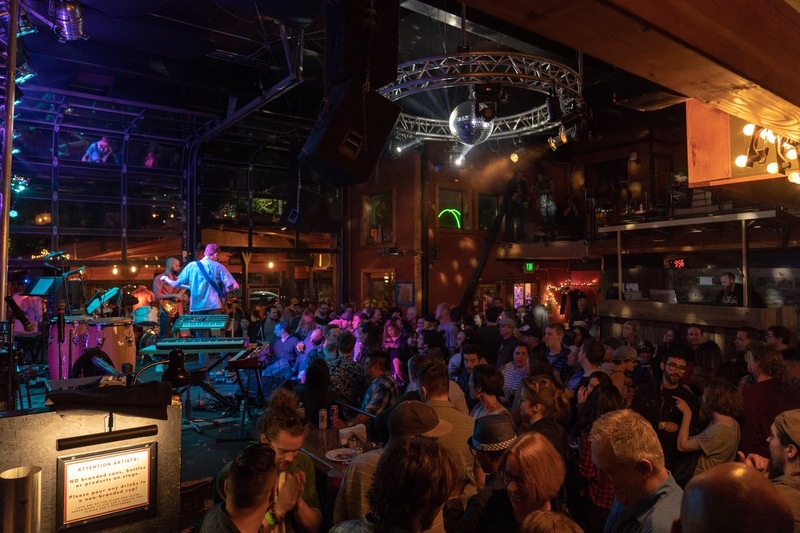 Lewis comes from a long line of Seattle musicians - his grandfather Dave Lewis was the giant of Seattle R&B in the 1960s - but he’s made a name of his own in the city, including as the original drummer of groove-funk trio McTuff. Lewis isn’t a drummer that merely keeps time or fills in space. He is a giant on stage: his sticks dance on the cymbals, slam on the toms, and he drives his three band-mates on. The group has been at it for over a decade, and their familiarity is obvious, as they oozed class and confidence. Not one note sounded out of place. And there were a lot of them. After seeing a 10-piece band sound expansive and spacy, it’s amazing that a quartet can sound so full. But with such agility! Just when I thought I could pin a label on a song, the group shifted, subtly, suddenly. The 90-minute set packed a lot of variety. 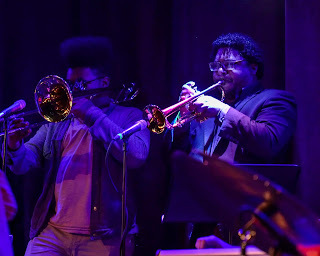 Orchestral, legato passages gave way to wandering, brash Miles Davis-esque fusion. Tight bebop and loose avant-garde shared space with psychedelic, trippy keys workouts that would make John Medeski proud. An Industrial Revelation show is like following a river from source to sea, then chopping it up and putting it out of order – offering a fast frothing torrent of notes screaming downhill; smooth, beautiful, and restrained vistas; and a murky turbulence pregnant with distortion. And the transitions were never jarring, bleeding into each other naturally. I’ve enjoyed the group’s studio work, but the band’s full-sounding repertoire seemed much more at home on stage, filling up a room. The quartet can’t sit still. While Lewis glided effortlessly across his kit, Flory-Barnes’ fingers looked on the verge of bleeding. Rawlings and Oluo aggressively dug into their grooves. 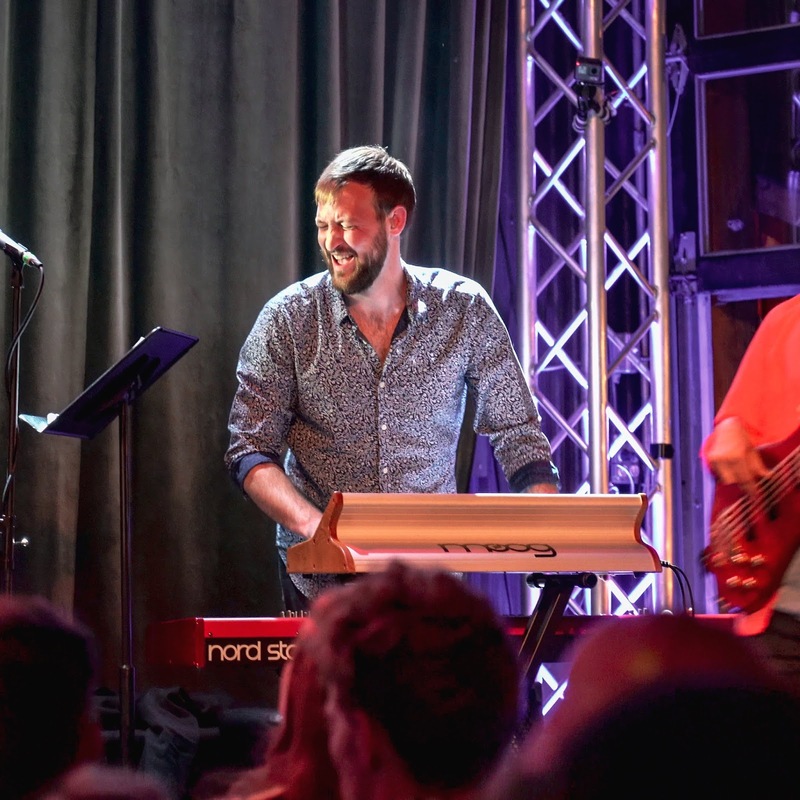 But one of the highlights of the set was one of the lightest moments – the band invited Darius Willrich on stage. I’ve been to many, many shows in the area, and I’m amazed I’ve never heard of this talent. His voice was a beautiful, soulful falsetto akin to Curtis Mayfield. (For reference: I LOVE Curtis Mayfield.) I closed my eyes and listened. I wish he could have stayed on stage longer, but soon enough, the quartet orchestrated another jaw-dropping solo section. The show fit seamlessly with my weekend mood. A not-quite R&B band and a not-quite funk band opened for a not-quite jazz band, each bringing their brand of inquisitive exploration to their audience. Few lineups are as simple as their playbill, and this one was no exception. I got to see a new take on Afrofuturistic R&B, catch the album release of a band I’ve seen many times, and finally experienced the live thrill of a local giant. It was a quite perfect evening of music.